If it’s one thing we love here at Let It Ride, it’s to help out small businesses/start up companies. When beer is involved, it’s just a bonus! San Diego is a mecca of craft breweries and we wouldn’t want it any other way. So when we got the chance to help out a brewery in Idaho, we couldn’t have been happier. We sat down with a couple of people involved with the brewery locally, got a game plan together to hurry and get some items done for a beer festival they were attending in Idaho over the weekend. They sent us over some photos they wanted to use, and trusted our judgement on coloring, items and placement. This was a pretty decent order and with a short time limit, but nothing we couldn’t handle! 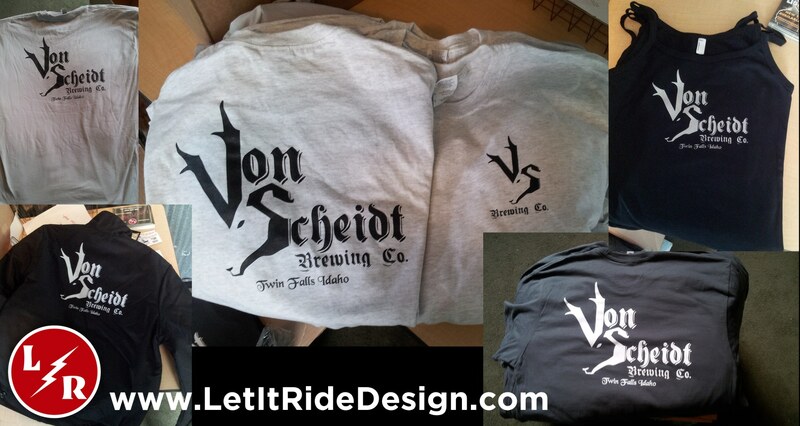 They needed some t-shirts to hand out at the festival, 2 different colors, t-shirts for the crew to wear, also in 2 different colors, some jackets for the crew to wear in the cold Idaho weather, tank tops for the girlies, and of course some pint glasses. For the giveaway shirts we went with Gildan shirts, light gray with black print front and back, dark gray with white print front and back. For the crew shirts we went with Next Level apparel, same concept as the gildan shirts, and the girls tanks are black american apparel with silver print front only (the picture doesn’t do justice to the ink color). They wanted some nice warm jackets to wear out in Idaho, and we couldn’t think of a better brand than Dickies, all were mostly black jackets, 1 was navy blue, with white print front and back. The glasses looked awesome, unfortunately we forgot to take a picture of them in the melee of getting everything shipped out in time. They ordered 72 pint glasses, some with black print and some with white print.